The Book of the Celestial Cow is one of Hethert-Nut’s primary myths. In the Book, Ra calls to Nut to become a cow and lift Him aloft, away from earth and into the heavens, where He can safely watch over the world. She does so, and when Her legs begin to shake from the height, Shu, the god of air, comes to support Her belly, and the eight Heh gods come to brace Her legs. Hethert, Nut, and Hethert-Nut have all been known to act as Mehet-Weret, the Great Flood, as well. Thanks to the flexibility of Kemetic monolatry (where God is God but also gods) and polyvalent logic, Mehet-Weret can be Herself, or a form of Hethert, Nit, Nut, Hethert-Nut, or some or all of Them. 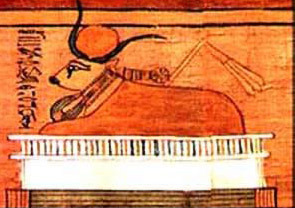 Nut’s role in the Book of the Celestial Cow is mirrored by Mehet-Weret, Who gives birth to the sun and lifts Him as a sun disc atop Her head, between Her horns, to keep Him safe and carry Him through the waterways of the sky. Because of this, the following bio will include references to the goddesses that can take the form of Mehet-Weret, as They can all play a part in Hethert-Nut’s iconography and identity, as well. I’ve tried to be as clear as possible; if you’ve got anything to add (or correct), please do speak up! – Roughly, anything related to Hethert being the sky, Nut being a cow, the Celestial Cow, and/or Mehet-Weret. O great magician, O splendid lady, O gold of the gods!